It has been a while since my last blog, in fact it has been a while since i had even been fishing. It was something i needed, something i missed, my daughter kept asking about it, the stuff she wanted for next season. Her own net being the key item. But with my promotion at work free time was limited and i knew how my good friend Mike France felt given his free time had also been limited by stepping up at work. 60 hour weeks over christmas with 3 hours sleep between shifts on some days took their toll and a trip fishing would have refreshed my mental state but through clenched teeth i made it past the toughest time of the year. It didn't only affect my fishing time it also took its toll on my socialisation. I keep in contact with a lot of people via facebook and even e-mail to my older friends and i just had no time as when i was home i was trying to catch up with my family. But 2018 was a very weird and also a very productive year, given the limited time i beat my PB again and my daughter continued to improve dramatically. I didn't get out as much as i would have liked chasing grayling in the close season catch only 13 all season over 2 trips comparative to 2017s total of 75. This however being mainly due to, obviously, the lack of time since my promotion and how good the trout season was going. 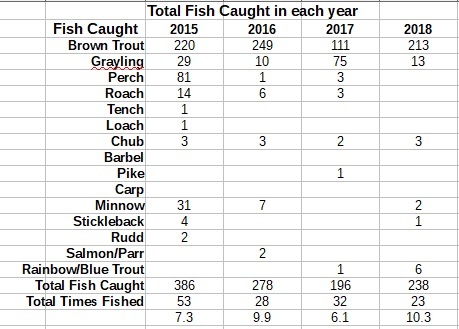 In fact out of the 23 times i went fishing (my lowest since i started fly fishing in 2015) i caught 213 trout. 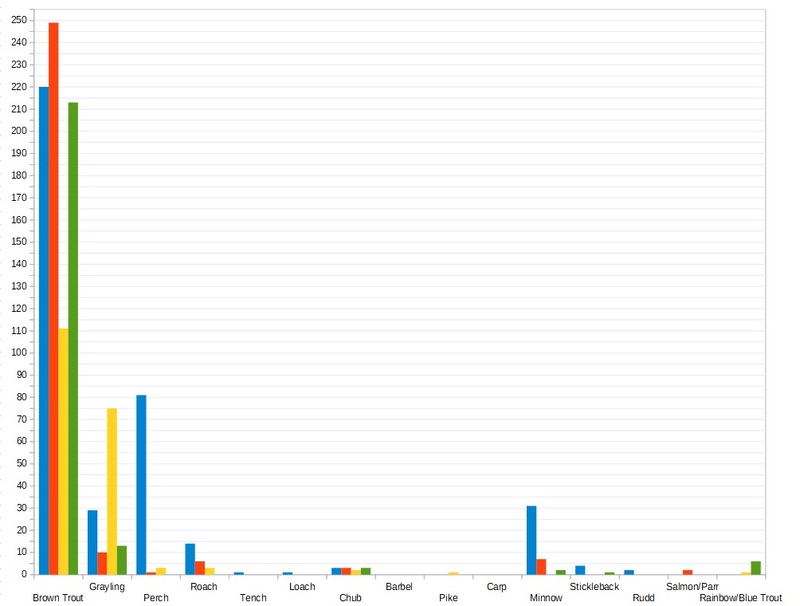 Below is the comparative totals over the years and as you can see my fish per trip average had greatly increased. I had avoided the lower Irwell this season but had fished below the pollution incident and had seen fish returning. Including 1 big one that i lost almost instantly as i had only been catching small ones. That was the first day i had been out with Al Meer who i hope to fish with again at some point this season on some of my old sections as he is very much a scenic angler. I had been fishing very public rivers in the pouring rain which pushed everyone away from the water which gave me plenty of good results. However used to humans these fish where it was clear they were still more comfortable when it was quiet. I prefered the quiet, the comments 'oh you won't catch anything in there', the lack of floating cans that had been thrown in the river upstream. The rivers suffered a long drawn out summer of no rain, in fact it rained after Englands exit from the world cup which is when i became the father of an orphaned egg. That first rain was a killer for the newly hatched birds but was heaven to the fish that had been suffering in the low calm waters that next season i will ensure will have environmental changes to them to keep flow moving during the low water seasons. The river only exceeded the 3m level once, on April the 2nd after heavy snow fall. So what do i have planned for next season and 2019? Well i hope to get on the river before the season starts and get some Grayling, to rescue my sanity. I need to sort out a new vice as mine has now broken and i havent tied a fly since September. All that work but financially am i better off? After tax? I hope to catch a few fish i have caught before with distinct features to monitor their growth rate. I already have a few named fish that have grown bigger and become the king of the bigger pool. I also intend on fishing my old sections of the Irwell, the number of big fish i lost on this section was immense but after the pollution they vanished but it has been 2 years this spring and so i will see if they have returned. I also intend to fish more with the people who have helped me improve as a fly fisherman as i enter my 4th season fly fishing. Mike, Graeme, John, Nick, Arthur, Al and hopefully some new faces i have spoken to who fish the same waters who might help me in my environmental improvements if we have a tough summer again.